THIS BYSTANDER IS reminded of an old Cold War joke about a Russian-English translation machine that kept spitting out ‘water sheep’ when it meant ‘hydraulic ram’. Something similar is happening in Chinese military circles where ‘seaplane’ has been transmogrified into ‘amphibious aircraft’. The difference is that planes that can operate on water have military value to a country whose national interests concern the disputed waters of the East and South China seas and the increasing projection of littoral power. Japan already has seven seaplanes — three older U.S.-built ones and four indigenous versions, the most recent being a 2007 Shinmaywa US-2 — to patrol its islands. The PLA-Navy has five 1980s-era Shuihong (SH)-5 patrol seaplanes in service, one of which reportedly crashed in 2013 near the PLA-Navy’s Northern Fleet airbase at Qingdao. 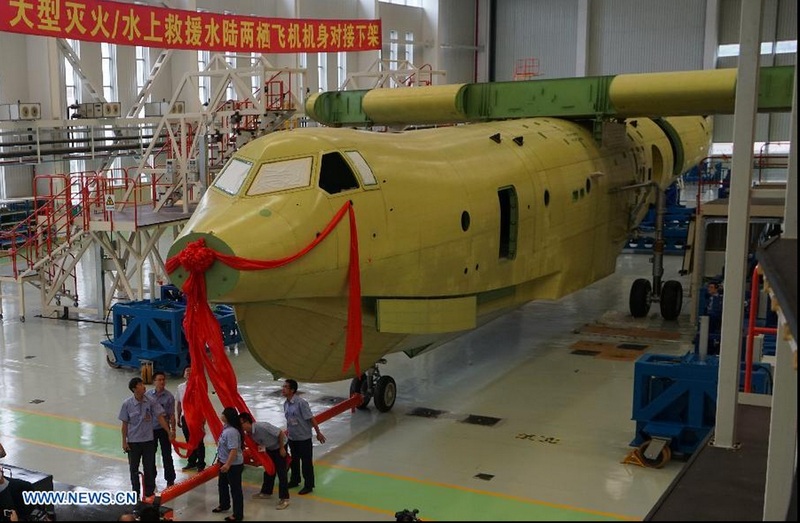 For the past six years it has been known that Aviation Industry Corp.’s China Aviation Industry General Aircraft subsidiary was building a giant modern flying boat, the TA-600 Water Dragon (and investing in seaplane companies around the world ). The aircraft, now relabelled the AG600, is in advanced production. 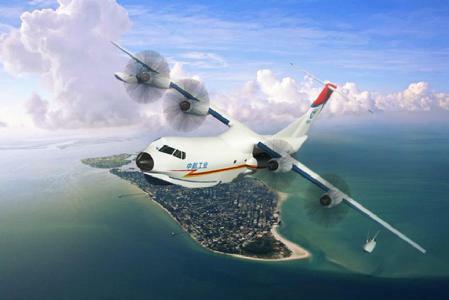 The image above is a AVIC artist’s impression. The picture to the right, of a celebration for the completed assembly of the fuselage, was published by state media in July. The turboprop AG600 is expected to make its maiden test flight early in the new year. AVIC has made a commercial single-pilot light seaplane, the HO300, since 2010. The AG-600 is larger than the Shinmaywa US-2, which would make it the world’s largest seaplane. It can carry up to 50 passengers and has a range of 5,000 kilometers. AVIC says it can be modred to meet the needs of “maritime surveillance, resource detection, passenger and cargo transport”. At the 2014 Zhuhai air show, where the AG600’s forward fuselage was on show, AVIC said it had two firm orders, one for search and rescue and one for firefighting, from an unnamed customer, but which is thought to be the coast guard. Militarily, the plane could undertake patrol and supply roles for China’s expanding islands in the South China Sea (all that dredging creates ideal landing channels for seaplanes), and, alongside China’s blue-water amphibious assault vessels, be part of an amphibious assault force. With a range of 5,000 kilometers, they could project power far beyond the littoral. It all fits with the development of the naval capabilities that has let the PLA-Navy deploy off the Horn of Africa (anti-piracy), Libya and Yemen (evacuation of Chinese nationals) in recent years. In the United States, analysis of China’s nascent amphibious fleet is de-emphasized in favor of monitoring China’s pursuit of a training carrier, long-range ballistic “carrier-killer” missiles and other “sexier” weaponry, reflecting a wider, deep-seated bias within the American national-security community. To Washington defense elites, China’s low-tech amphibious platforms are comfortably unthreatening. Same sees true today of its flying boat.